Ask any gardener what they could use more of in the garden, and you’re bound to hear, more money, more time and more tools. It's no surprise, having the right tools for the job can help save a lot of time and money. 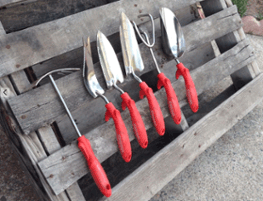 Over the years, we've talked to a lot of gardeners who have some clear favorite Corona tools in their tool shed. So, we put together this helpful list of long-time, garden tool gift ideas, for the busy gardener on your shopping list. And since most gardeners are on a budget, these gift ideas range from $10-$40. Look for for the special online code below and you can save some green in the process. Do you have a favorite Corona tool on your holiday wish list this season? Tell us what you’d like to see on your doorstep in the comments section. We’ll be selecting 3 wishes to receive what's on their list. Check out the list of favorites and get the details to win below. RazorTOOTH Saw® is extremely fast and efficient. “BEST SAW EVER! For 8” cuts, no need to own a chainsaw. I’ve made a living with this saw and it never lets me down.” - Web review by Mountry. Trimming herbs, roses or hydroponics? The NEW Corona Micro Snips with ComfortGEL ® grips are engineered for those precision cuts. Sharp stainless steel blades with double-bevel tapered tips provide maximum control. A great addition to any toolbox. Rake your leaves in half the time and move on to your next project with the BigLOAD™ Leaf Rake. 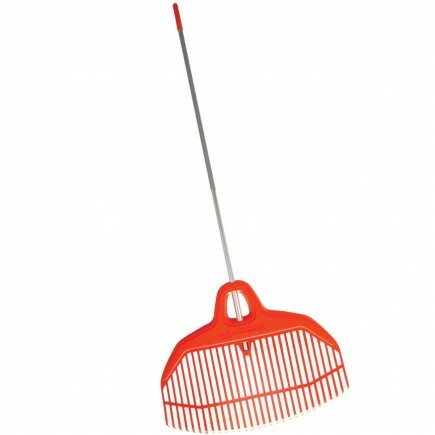 The Corona 30” BigLOAD™ Leaf Rake features a unique head design that maximizes load capacity and is both lightweight and durable. 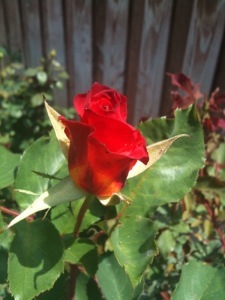 Featured with a five-star rating on Gardendingproductsreview.com. Put more cutting power in your hands with the 4-gear ratcheting action. RatchetCUT makes a series of smaller, full-leveraged cuts. 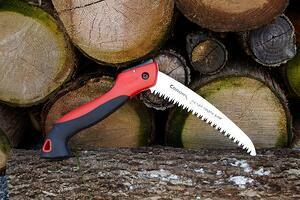 Power through thick branches and dead wood up to 3/4’ with less stress and fatigue. Named in ROL’s Top 100 Innovations 2017, FlexDIAL® lets gardeners dial in your own custom setting to reduce work and fatigue during repetitive cuts like dead-heading. Dial to 8 for larger hands, 1 for smaller hands. What’s your number? Its compound lever amplifies cutting power on branches and limbs up to ¾ with less work. The full steel chassis with ergonomic comfort grips and coated, non-stick, high carbon steel blade, will provide performance and durability, season after season. 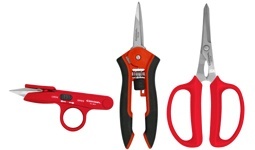 Gardeners love these snips for a wide range of applications. Professional floral designers chose this tool for quick, controlled cuts. Stainless steel blades prevent rusting and reduce germ build-up. They’re the perfect size to keep a pair in the garden shed, a kitchen drawer and in the console of your car. Tell Us What's on Your Wish List! Does your shovel need to be replaced? Need the extended reach of a tree pruner? 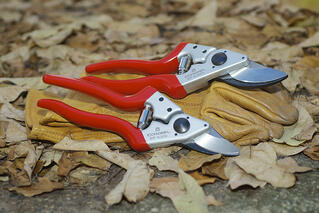 Could you use a new pair of shears to trim back that wall of vines or sculpted shrubs? Tell us what Corona tool tops your holiday wish list this season and how it will help you in the garden. We’ll select our top 3 favorite comments, which means you could find it on your doorstep. Winter may not seem to be the ideal time for most people to think about their gardens. However this time of year, savvy gardeners are busy planning and preparing for the upcoming growing season. Including attending a local seed swap for seeds during National Seed Swap Day on 1/28/17. There is more than seeds at a seed swap event. You'll find educational session from expert gardeners and horticulturists who share great tips and ideas for confident gardening. 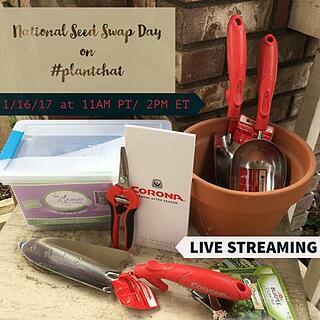 If you want to learn more about attending one in your area, join us for our first live streaming #plantchat on 1/16. 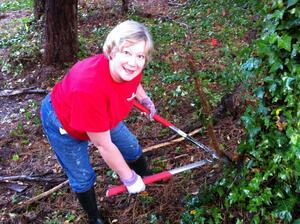 We'll have a live Q&A with Kathy Jentz, editor of Washington Gardener Magazine. A great way to learn how to grow is through asking questions. Just take a look at the topic highlights in the Discussion Overview below and submit your question at the end of this post in the comments. Want to know how to find a seed exchange in your zone? Or maybe how do you start your own local seed swap? You can also ask your question during the chat. We'll pick the best question to win an amazing seed starting and saving package from Corona Tools. It features Corona's ComfortGEL® garden hand tools (trowel, transplanter, extra large scoop), curved snips for thinning seedlings and our printed guide, Principles of Planting. You'll also need a great way to store seeds throughout the year, which is made easy with a SeedKeeper Deluxe kit. The combined set is shipped from Corona follwoing the live event. ($85 value) . What is National Seed Swap Day - Hear how it got started and grown. How to Find Good Seeds – learn how and where to get good quality seeds that you can grow with confidence. Tips for Seed Starting and Saving – discover methods to help grow seeds and properly save them. Truths and Myths About Seeds – from organic vs. non-organic to GMOs, here's what you should know about seeds. Find Your Local Seed Swap – tips for finding your local seed swap. Connect and share with the green industry leaders live on social networks to learn and share about hot topics in the green industry. Now plantchat is part of the Green Industry Leaders Network (GILN) presented by Corona and its partners. We are an alliance of professional organizations who are advancing the horticulture, tree care, and landscaping industries. It's that time of year when gardeners everywhere start planting bulbs to produce amazing flowers in Spring. On the next #plantchat, 10/17, we'll dive into the specifics of daffodils bulbs, varieties and tips for growing them with confidence. The American Horticultural Society and Longfield Gardens will be sharing their knowledge and how-to tips for growing one of Spring's most beloved bulb flowers. We will also be awarding prizes during this #plantchat including the Longfield Gardens Golden Glow Collection and a Corona ComfortGEL® trowel and transplanter with integrated depth gauges for precise bulb planting! Here's how you can win one of these great prizes. A great way to learn how to grow is through asking questions. Just take a look at the topic highlights in the Discussion Overview below and submit your question at the end of this post. Want to know which bulbs grow best in your zone? Or what should you do with daffodil bulbs once they have bloomed? You can also ask your question during the chat. The experts will be on hand and answer all your questions live. We'll announce the lucky winner of the Longfield Gardens Golden Glow Collection and Corona garden tools during the chat. So come join us and hopefully see you name in tweets! Join @CoronaTools and #plantchat co-partner, American Horticultural Society, Digital Communications Manager, Charlotte Germane and Vivieka Neveln, tweeting as @AHS_Gardening, and special guests Kathleen LaLiberte and Marlene Thompson of Longfield Gardens tweeting as @LFGardens . Our topic is Growing Daffodil Bulbs with Confidence. The live chat begins Monday, October 17, 2106 at 11 a.m. PT / 2 p.m. ET, where we come together with green industry experts and fellow horticultural tweeps each week to discuss all things related to plants and horticulture, since 2014. When and How to Plant Daffodils – tips for when to plant bulbs and proper planting methods. 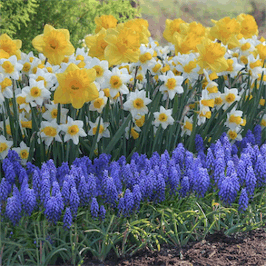 Selecting Daffodils – learn what the difference is between narcissus and jonquils varieties. Bulb size relates to number of blooms – understand how size determines the number of stems many blooming stems. Container Daffodils – growing in daffodils in containers creates brings bursts of Spring throughout the garden and patio. Best Daffodils for Naturalizing – discover which cultivars multiply quickly and lead to more blooms. Don’t miss out on this exciting topic and join the conversation via Twitter. Just sign into #plantchat with your Twitter ID and you can follow the conversation and share with the community. 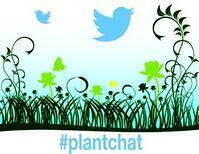 Be sure to add the hashtag to all your tweets or join us in the plantchat room on Tweetchat. They will automatically add it for you and it's easy to watch the conversation as it happens! If you have ever felt growing roses is too difficult or you just can't do it, we have a boost of Corona Confidence that will make anyone a success when growing and caring for roses. Here are some easy tips you can use to grow them from America’s Favorite Rose Gardener, Chris Van Cleave. 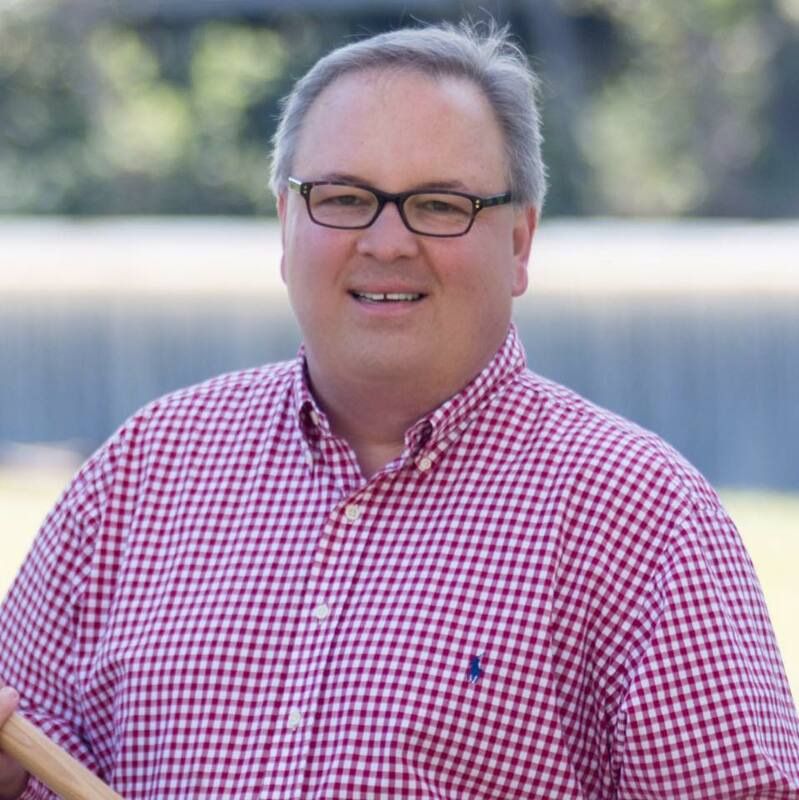 He's the co-host of Rosechat Radio, and known on Twitter as @redneckrosarian, and shared his 3 top tips for growing good roses. We also want to hear your favorite tip for growing roses successfully, which could win you an exclusive Corona Tools Rose Care Kit. Just check out the details following Chris' tips for how to submit your tip for a chance to win! Roses need at least 4 hours of full sun a day to thrive. They should also be planted in a well-draining compost rich soil. Deadhead your roses! Remove spent blooms after each bloom cycle to encourage new growth and a fresh round of wow! Thanks, to Chris Van Cleave! The Corona provides all the essential tools you need to prune your roses, to keep them healthy and thriving, season after season. The forged Convertible Pruner + Lopper (BP 7450, $40) is ideal for harvesting roses for display as well as annual pruning. Its extendable handles can also fold down, converting this pruner into a mini lopper. It helps provide the extra leverage you need when pruning thicker canes, up to 1 1/4". 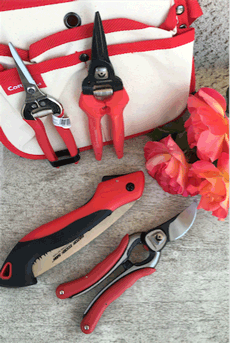 The ComfortGEL® Floral Snips (FS 3204, $16) with comfortable gel grips are excellent for deadheading spent rose blooms. If you have multiple rose bushes, you will appreciate the added comfort after a day of deadheading. 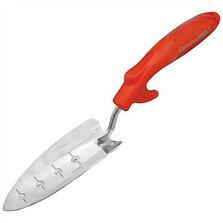 These snips also have a built-in thorn stripper so you can cut roses for display and easily remove the thorns. The Razor Tooth® Folding Saw (RS 7245, $27) is a must have for any confident gardener with roses. When you come across larger canes or dead wood, this handy saw is the tool for the job. It makes cuts fast and folds up to be compact for easy transport. The Long Steel Straight Snips (AG 4930SS, $12) are ideal to use indoors or outdoors on roses. Keep them inside to cut the ends of your displayed roses so you can change the water and help them stay fresher longer. They are also great outdoors on roses, to remove spent blooms and any fine, detailed cutting needed on smaller bushes or vines. The kit also includes a Corona tool pouch that you can wear while you are out in the garden and store in your tool shed. Just grab it every time you head out the the garden and be confident you will have all the tools you need to take care of your roses. For a limited time, you can submit a rose growing success tip for a chance to win a Corona Tool Rose Kit. Submit your tips below, in the comment section. Share your favorite tip about pruning roses that has been successful to you. We'll select the best tip and announce the winner Friday, June 6th on Facebook and contact the winner directly. Good luck and enjoy your confident success growing roses in the garden. This weekend is Daylight Savings and although we may lose an hour of sleep, we gain an extra hour of daylight to work in the garden. And with only days until Spring, now is a great time to think of ways to maximize your time this season. We've put together a list of must-have, time saving tools, that will help with getting your garden tasks done quicker and give you the confidence to achieve more of your springtime gardening goals. #2 Round Point Shovel, Hollow Back Ideal for breaking ground and turning spring soil, with pre-sharpened, 14-gauge, tempered steel blade that penetrates ground easily to get the job done fast. Let the shovel do the hard work for you and be finished in no time. Stainless Steel Long Straight Snips These handy snips are lightweight and perfect to keep in your garden tool belt or back pocket, every time you step out in the garden. They are ultra sharp to quickly harvest some herbs for dinner or deadhead spent blooms. Forged Aluminum Bypass Pruners A good pair of bypass pruners is essential for maximizing your time in the garden. Choose one that fits your hand like a glove and won't weigh you down when there is plenty of pruning work ahead. With a perfect fit for large or small hands (or lefty), you'll be in the pruning zone! 9-Piece File Set Maintaining the cutting edge of your tools is often an overlooked time-saving practice in the garden. Keeping your pruning and digging tools sharp with Corona files will help retain the tool's cutting performance, whether pruning back tree branches or digging large holes in the planting beds. It takes just a few seconds to sharpen so you can power through garden tasks. Forged Dual Cut™ Bypass Loppers If you have larger limbs or branches (up to 2") to cut, a pair of bypassloppers are a must.The special blade and hook design also provides 20% more cutting power. With one cut, you can remove the limb and cut into smaller sections for the green waste bin for fast clean up. 7-inch Razor Tooth® Folding Saw Branches that are 2" or larger in diameter can be removed quick and easy. It cuts on the pull stroke requiring less physical effort. And the advance design of the blade's teeth keeps the cutting channel free of saw dust. That means making faster cuts and removing unwanted limbs easily. EasyLifter® Wheelbarrow If you have a lot of work to do in the garden, the wheelbarrow can be your best friend. Pile in mulch and transport to all areas of the garden. Haul in mounds of soil for raised planters. Or help move heavy plants or pots. It will save your back and the fulcrum on the front takes all the weight of the load so you can easily dump it. For nearly 90 years Corona has been making tools that gardeners, landscape professionals, arborists, the aspiring hobbyist and everyone in between. Generations have relied on them and developed confidence to get the job done. If you are a long-time Corona user with your own favorite tool that is essential this Spring, share it with us in the comments below. Be sure to include the tool name/ number and how it saves you time! Rake up your leaves twice as fast with the BigLOAD Rake. 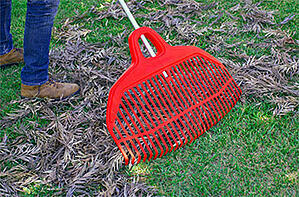 The oversized rake head has more surface area to collect leaves faster and get the job done fast. It's lightweight, with a 63-inch aluminum handle that extends your reach to help limit excessive bending at the waist while raking. Finish the sentence in the comments below for a chance to win. "The BigLOAD Leaf Rake gives me Corona Confidence because _________________"
Remove branches the easy way, with Corona's efficient Razor Tooth Saw®. First, the folding saw is ergonomically designed with a curved blade design that locks open, but folds into the handle for easy portability. Three-sided razor teeth for efficient cutting on the pull stroke are impulse-hardened for a long service life. The blade is curved for faster cutting, and is both taper ground with a replaceable blade when needed. It easily folds up for safe transport and can be used in the garden, on the trail or campsite. The only time you'll be lost is without it. Finish the sentence in the comments below for a chance to win the Razor Tooth Saw®. "The Razor Tooh Saw® makes me Corona Confident because _____________________________________. Tackle limbs up to 2" in diameter with the Forged Dual Cut™ Bypass Lopper. It delivers 20% more cutting power and enhanced performance with large cuts due to its patented blade and hook design. “Corona's Forged Dual Cut™ Bypass Lopper will make me feel Corona Confident because . . . "
Make precision cuts for mincing herbs, hydroponics, micro greens, flower prepping and other fine work. It's easily accomplished with this trio of micro snips. All of these precision stainless steel cutting tools can be sterilized between cuts to limit cross contamination. First, the Finger Micro Snip FS 4110 are the smallest Snip, with sharp, 1 1/4-inch stainless steel blades and a pointy tip that allows for precision cutting. Next, the versatile Micro Snip FS 4120 has a heavy-duty spring for reliable performance and a double-sided lock that's good for right or left hand use. Compact 2 5/16-inch stainless steel blades are double beveled with tapered tips for precision cuts. Finally, the Scissor FS 4130 have 2-inch stainless steel blades with double beveled tapered tips for precision cuts, and durable lightweight handles. The perfect fit is available now among this trio of Corona Forged Aluminum Bypass Pruners, whether you have a small hand, a large hand or are a Lefty! With a replaceble blade option, this is one bypass pruner that will last you for many seasons to come.